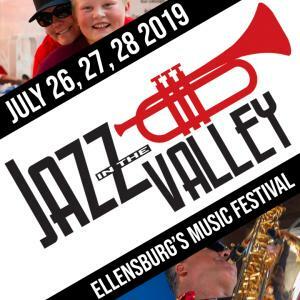 Jazz in the Valley is Ellensburg's annual nonprofit July music festival for the last 21 years. We're happy to announce the 22nd annual Jazz in the Valley festival will be held July 26, 27 and 28, 2019. Stroll through downtown Ellensburg over 3 nice Central Washington days to listen to 28 different performances crossing 8 genres of music. Best of all, we aim to be the most cost-effective jazz festival of our kind with a full weekend pass for only $60 if you buy before July 1, 2019. If the music wasn't enough, you can also enjoy premium Northwest wine tasting, local craft beers, and great speciality dining inside the festival and within downtown Ellensburg. View our lineup at https://www.jazzinthevalley.com/lineup.html! Children are welcome at all venues, with kids 12 and under admitted free, so you can bring the whole family. The Main Box Office will be available for pass redemption at any time during the festival starting at 2 pm on Friday, July 26th, 2019. You must redeem your online purchase for a button or wristband at the main box office before entering any venue. Again, please remember that you will not be able to redeem this online ticket for a button or wristband at individual event venues.